Techstars Mobility, an organization created to support new automotive technologies and promote innovative entrepreneurship, will hold its second annual mentorship-driven accelerator program for mobility and transportation startups in Detroit. Of the 500 companies from 52 countries that applied, 12 firms that build automotive technologies and products were selected to participate in this year. Serbinski says the program, which runs from June to September, will focus on connected, shared, and autonomous technology for automobiles. The companies selected include: Acerta, Algocian, Machine Learning, Braiq, Cargo, Donut Media, Drive Spotter, GoKid, Haas Alert, Hero, Rally Spatial, and Voyhoy. In turn, the accelerator program has partnered with eight global corporations — Ford Motor Co., Magna International, Verizon, Dana Holding Corp., Honda R&D Americas, McDonald’s, Munich Re, and Michelin — to assist the startups during the three-month accelerator program. Serbinski says Techstars Mobility recently partnered with organizers of the North American International Auto Show in Detroit to bring more than 50 mobility startups to the city in January 2017. 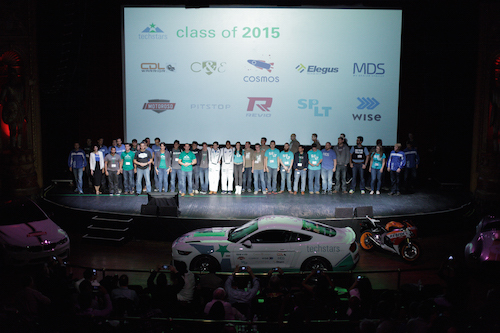 Across the nation, more than 150 mentors across 38 different automotive and transportation companies are active in the Techstars’ accelerator program.